Originally published March 23rd, 2017 on the Tiny Cables Medium publication. Serious bonus points if you had your initials monogrammed on this bad boy. The L.L. 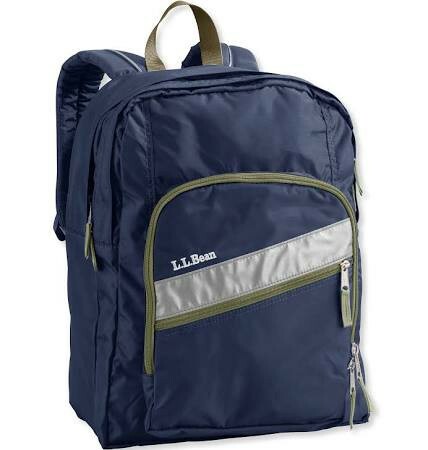 Bean Deluxe Plus School Backpack. A masterpiece. There was simply no other way to transport your pencils, Pogs, and folders to and from Gainfield Elementary. Two reasons that L.L. Bean took over the New England elementary school universe: kids loved that they were the most fashionable backpacks imaginable, and parents loved their 100% Satisfaction Guarantee. L.L. Bean’s 100% Satisfaction Guarantee meant that the company would accept a return for any reason with seemingly no limitations. When six-year old Andrew discovered that L.L. Bean would send a replacement whenever I grew tired of the color of my backpack, I turned into a monster: I would break a zipper or cause just enough trouble to warrant an exchange. A quarter-century later, my mom remains a loyal L.L. Bean customer. I spot a new L.L. Bean jacket, bag, or a pair of slippers every time I go home. L.L. Bean earned her lifelong loyalty — she buys with confidence knowing they stand behind the quality of their work. The reason I bring this up is we want to do the same thing. Tommy said it when he first proposed this project: “these need to be high quality cables!! Great warranty like Monoprice.” It stands to reason that a great warranty will address one of the main objections that consumers have when buying from a new entrant to the market. Preach! Like. RT. Heart. However you want to say it: we’re in on that. The big question, of course, is cost. How do you prevent abuse by the 6 year old Andrews in Connecticut? I knew two things: the financial implications had to be complicated, and there had to be more that I’m missing. I sought case studies and other publicly-available information about warranty programs. There isn’t a lot out there on warranties so I’m going to be as thorough as I can be within 2,300 words. If you’re looking for something a little deeper, I suggest clicking any of these words as they’re all great resources. How do you make the financial side of this work? It’s important to look at what everyone else is doing. As we look to reduce the perceived risk in buying tiny cables from Tiny Cables, it’s important to consider what the competition is doing. If we bust our tails to offer the exact same thing as every other company, what unique value are we really offering? Most of these retailers offer a blanket 14-day return/exchange policy, and Apple (unofficially) guarantees cables that come with their phones and computers for a year. I was surprised to find that almost every cable listing offered some sort of warranty. In some cases, a seller would offer “30 days money-back and 12-month limited warranty,” with no additional details. Others offer “24-month Warranty and Lifetime Free Customer Service,” which makes me wonder what kind of customer service people really need — aren’t we just talking about a cable that works or doesn’t work? A surprising number of listings offer a lifetime warranty. Monoprice, Tommy’s gold standard for warranties in this area, offers a lifetime warranty on cables sold through their site. It’s worth noting that items filled by Amazon are covered by their blanket return and replacement policies. It looks like this is a 30-day money back for unopened items, 30-day exchange for defective items. According to our unscientific tally, about 40% of Amazon listings offer a lifetime warranty, 15% offer a 12–24 month warranty, and 45% make no mention of a warranty or guarantee. Even with 55% of the third-party competition offering some level of warranty, none of them were as explicit as the L.L. Bean 100% Satisfaction Guarantee. I purchased product from the competition to test their quality ahead of our launch — I wanted to compare quality — and fortunately, all three were listings that offered a warranty. Time to put these warranties to the test. I e-mailed and said that the cable had simply stopped working. We exchanged a total of twelve e-mails while they asked if I had exposed the cable to water or if I had been negligent in any other way. It seemed obvious that they were trying to sniff out how dedicated I was to getting a $10 cable exchanged. In the end, they agreed to exchange the cable but I was on the hook for shipping ($6). Not a good experience. I e-mailed and said that I needed to exchange my cable. They replied promptly, asking a set of questions similar to the ones I saw in my first attempt. I nipped their line of questioning in the bud, sending a mega-e-mail that covered all of the questions I had been asked before but intentionally dodging questions about my own negligence. This warranty made no mention of limitations (other than 18-months), so I wanted to see how they would respond to an order who had clearly been negligent. I told them I cut the cabling in half with scissors. They laughed and didn’t seem to care. If I sent the snipped cable back and paid for shipping ($5), they would replace it within a week. Paying for shipping is less than ideal but it was good to know that I could be a total idiot and get the cable replaced. Four e-mails, no replies. Sigh. More than half of our competition offers some level of warranty but the terms of each warranty are wildly inconsistent. There is variance with the length of time that a warranty of offered for and in terms of what an acceptable reason for the exchange is. Sometimes sellers say they offer a warranty and then ignore you completely. Warranty claims often require the buyer to pay for return shipping which is typically $4-$6. As a consumer, I was left feeling that figuring out how to make a warranty claim was so time-consuming that it wasn’t worth it. These cables are $5-$15 items — if it takes 10+ e-mails or more than a half-hour to figure out, it’s a negative return on your time investment. Perhaps that’s what these cable sellers are banking on. Warranties with rules are super annoying. Offering a warranty might be an expensive proposition. My fear in offering a warranty is that I’ll sell a cable once and have to send twenty cables to a single customer. While this is a valid concern, we’re going to focus on the long-term value of the customer rather than the financial reality of the single sale. 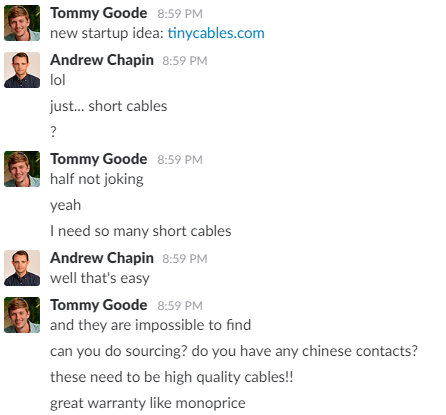 It’s also important that we’re focused on selling a quality product — these cables shouldn’t fail or give people a reason to seek an exchange. This places an increased importance on testing, the subject of our next post. Manufacturer failure rate — the % of product that is dead on arrival. Our leading candidate told us that their failure rate is around 0.5%. 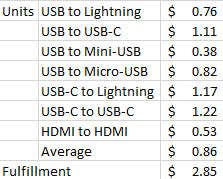 Shipping damage rate — the % of product that will be damaged in transit from our warehouse to the customer. A study by Stella Service reviewed 3,234 package deliveries between January to September 2012 and found that 313 (~10%) arrived in poor condition. Yikes. Interestingly, UPS had the highest damaged package rate (11%), ahead of the USPS (10%) and FedEx (7%). They also found that 19 sellers that were part of the survey (including Abercrombie, Dell, Target and Walmart) reported zero damaged packages in the study. Seems like packaging is an important component to this equation. We’ll add some bubble wrap to our packaging (for 10 cents) and estimate that our shipping damage rate will be 1%. Customer damage rate — the % of consumers who will treat the products in a way that will require replacement. We know that one popular use case will be use with portable cell phone chargers so these things will be out, about, shoved in jacket pockets, bent, and generally beat up. We also know that a primary segment of our audience is nerds who have high standards for the performance of their equipment. My gut feel is that this might fall around 10% (1 in 10, lifetime). Since these are overall averages and they’ll have to bake in instances where a single customer requires multiple replacements (like the 6 year old Andrews in Connecticut) and since I like round numbers, I’m going to guess that the overall warranty claim rate will be 15%. That’s a lot. Can we afford to do this? We have to decide whether we want to accept responsibility for the return shipping cost, especially since none of the third-party sellers wanted to earlier. If we assume that people can use the same packaging we sent the cable in (or provide their own), we’re only on the hook for shipping. This varies a lot based on geography so it feels right to seek out a flat-rate label — but at $6 for USPS and $7.50 for FedEx, that’s a non-starter. The FedEx business account calculator allows us to print return labels — labels we’re only on the hook for if someone actually uses it. It figures out the ground cost and bills it to our account automatically. That makes this easy (logistically) but doesn’t offer an exact answer to the cost question. A couple of quick tests put the cost between $3 and $5. That’s doable. And maybe we don’t even need to ask for the return in all cases. We’ll have to test this. In the interest of simplicity, let’s say that we sell 10,000 single units and that we hit our averages exactly (meaning that we sell an equal number of each kind of unit we sell). That’s $37,057.14 in expense to product, pack, and ship 10,000 cables. If 15% of these people require an exchange, that’s 1,500 * (shipping + unit cost). 1,500 * (4+3.71) = $22,260 in expected expense to offer a warranty to these 10,000 people. Given that we wanted to sell our units for ~$5.99 per unit, that kind of stinks. Oh well. With a great warranty comes an increase in price. I think people will understand the need for a higher price point and they’ll appreciate that our warranty comes with no limitations and we cover the shipping expense. Hopefully this leads to loyal customers who become repeat buyers for many years. And hopefully we don’t go over our 15% claim number. In addition to removing warranty limitations and covering the shipping expense, we want to make it super-easy to make a warranty claim. No e-mail chains that require 10+ messages, no ghosting, no games. We’ll build a slick webpage to submit a claim and start the process and we’ll feature that prominently on our shop and order receipts. If your cable stops working, send it back to us. We’ll send you a new one.